FRANCES DENSMORE'S PROLIFIC CAREER depended on a one-woman support staff: Frances' younger sister Margaret. have this wonderful sister who can manage Indians "like a book" and on whom I depend in all important decisions. She has never done any of the actual work but is my "observer" and nothing ever gets by her. The balance of our partnership is remarkable. She was drawing the highest salary in her grade in the Minneapolis Public Schools when she gave up everything to forward my work and has been my constant companion in the field. 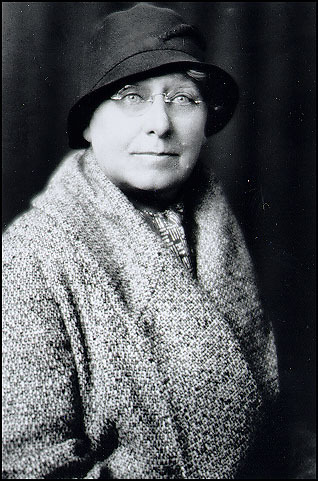 Margaret died of heart failure on 25 January 1947, at the age of 73. She had supported Frances' research for more than 40 years. Frances suffered the loss heavily. At age 80, her lifelong companion was suddenly gone. To save money and escape the burden of housework, Frances sold the family home in Red Wing and moved to a rooming house up the street. Frances lived alone until her death ten years later. Frances and Margaret are buried side-by-side in an oak-shrouded cemetery on a bluff above Red Wing. 1. Daniel Densmore, Densmore genealogy, Benjamin Densmore papers, Minnesota Historical Society. 2. Obituary, Red Wing Republican, 27 January, 1947; interviews with the following people who knew the Densmores: Charles Hofmann, St. Petersburg, FL, 14 August, 1994; Monroe Killy, Minneapolis, 31 August, 1994; Charles Biederman, Red Wing, MN, 26 July, 1994; Gladys Holst, Red Wing, 1 September, 1994. 3. Frances Densmore to Charles Hofmann, 28 September 1943, Hofmann collection; Densmore to Stirling, 18 July 1931, BAE Correspondence, National Anthropological Archives, Smithsonian Institution, Washington, DC; Densmore to Spivacke, 15 March 1941 and 21 April 1947, Densmore correspondence, Archive of Folk Culture, Library of Congress, Washington DC.